As a lean, low-calorie source of protein, fish are an important part of a healthy diet. However, it may not be healthy to eat some fish because their tissue contains contaminants that can be harmful if eaten in large quantities over a lifetime. 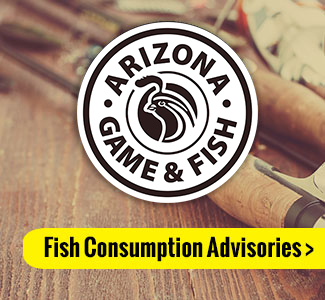 To keep Arizona residents and visitors informed, ADEQ monitors contaminants in fish tissues statewide, prioritizing waterbodies that are popular fishing spots. When ADEQ’s tests show a fish species in a stream or lake has a contaminant level higher than health standards, ADEQ issues a fish consumption advisory that identifies the contaminant of concern and provides guidance for which fish to eat and how much. Each year, ADEQ works in collaboration with the Arizona Game and Fish Department to sample fish from 15 to 20 Arizona streams and lakes. ADEQ tests filets of sampled fish for mercury and other pollutants, such as polychlorinated biphenyls (PCBs), that may be harmful to public health and the environment. The most common contaminant in fish tissue in the Unites States and Arizona is mercury, a toxic, persistent and bio-accumulative pollutant. Mercury is both a public health and environmental concern because it directly affects the nervous system, harming people and wildlife exposed to certain levels.